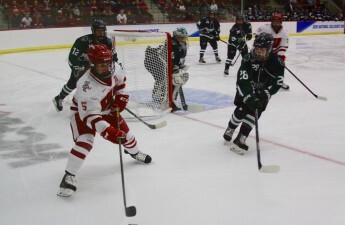 The Wisconsin women’s hockey team continued their successful 2016-2017 season this weekend, defeating the Clarkson University Golden Knights 3-2 and 4-1 Friday and Saturday. The win on Saturday marked the historic 400th career victory for Wisconsin head coach Mark Johnson. Johnson is now the first Western Collegiate Hockey Association coach to achieve this milestone, and third in the NCAA. Johnson told UW Athletics that one of the reasons that he achieved this accolade was due to the players he has worked with since coming Wisconsin. Johnson wasn’t the only person in the program who would tally a career milestone during this weekend’s contest. Senior goaltender Ann-Renée Desbiens, who has spent the last few seasons setting record after record, managed to make another stellar achievement this weekend with her 75th career win for the Badgers, tying with former Badger Jackie MacMillan. The freshman also got in on the trend this weekend as freshman Presley Norby tallied her first collegiate goal Saturday afternoon. Norby tallied several assists so far in the season, but this was the Minnesota native stand-out’s first time lighting up the lamp on her own. Though the team has much to celebrate now, it seemed like the Badgers (5-0-1, 1-0-1 WCHA) might come out of this weekend with a rather dismal weekend behind them. The Badgers struggled against the Golden Knights (2-3-1, 0-0-0 ECAC) trailing behind well into the second period. The Badgers managed to tie the game up 2-2 with a little more than ten 10 minutes left in the period. 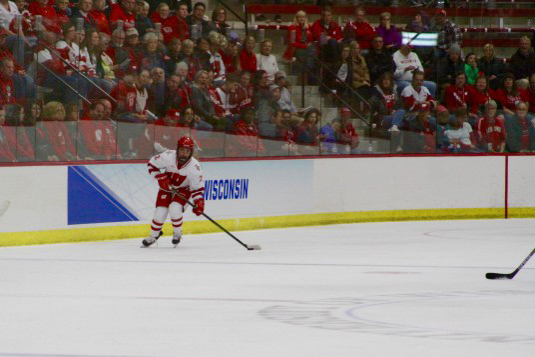 It would be junior Emily Clark’s overtime goal that would give the Badgers their first win. The momentum continued into Saturday, when Wisconsin would put the nail into Clarkson’s coffin by scoring three third period goals. With a winning weekend against this non-conference team under their belt, the Badgers now resume WCHA play, meeting the University of North Dakota next weekend in Grand Forks. Clark told UW Athletics that this team needs energy, like that provided by their weekend wins, to keep up their winning momentum.